A conversation developed in response to my Hail the Setter! 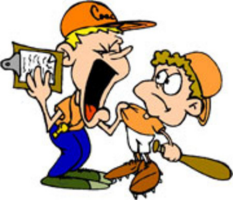 post on the subject of coach vs. player play calling. That actually stimulated Oliver at Volleyblog to put up his own post. It includes a comparison he did between volleyball and American football for his German coaching qualifications. I thought it was worth developing a deeper discussion of the play calling subject. That is the motivation for this article. 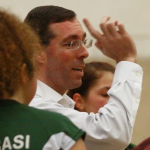 There are a couple of ways to think about play calling from a volleyball perspective. One is defining a basic offensive or defensive structure. The other is looking at things on a rally-by-rally, or even play-by-play perspective. The former deals with looking at broad patterns, both in terms of your own team’s strengths and weaknesses and the tendencies of the opposition. For example, you may generally play a perimeter defense, but go rotation against certain teams for better tip protection. Those are important considerations, but it’s the more micro level play-calling that’s the real subject here. Is it worth calling plays? Let’s face it. In some cases it makes little sense at all to think about play calling. If your players lack the technical ability or sophistication to run different plays, then play-calling accomplishes nothing. Beyond that, though, sometimes there’s really no need. A lot can be accomplished with a base play. Think about it. In football terms a setter can be thought of as being a lot like an option quarterback. The setter knows the situation and their attacking options. As the ball comes to them they make a decision which option to select based on the quality of the pass, the disposition of the block, etc. Just as a well-executed option play in football is hard to defend, a setter who makes good decisions and puts their hitters in good situations is very hard to play against. Of course the idea behind having multiple plays is to try to create mismatches, exploit weaknesses in the other team’s block/defense, and the like. If your team has the quality to execute different plays then it makes sense to diversify your play. The question is who makes those play calls. In football it used to be that quarterbacks called their own plays. These days that’s largely no longer the case. The exception would be audibles before the ball is snapped based on the opposing defense’s positioning. Nowadays plays are called from the sidelines by the coaching staff, sometimes in quite creative ways with hand signals, posters, and other visuals. With some team even the audibles are called from the sideline. 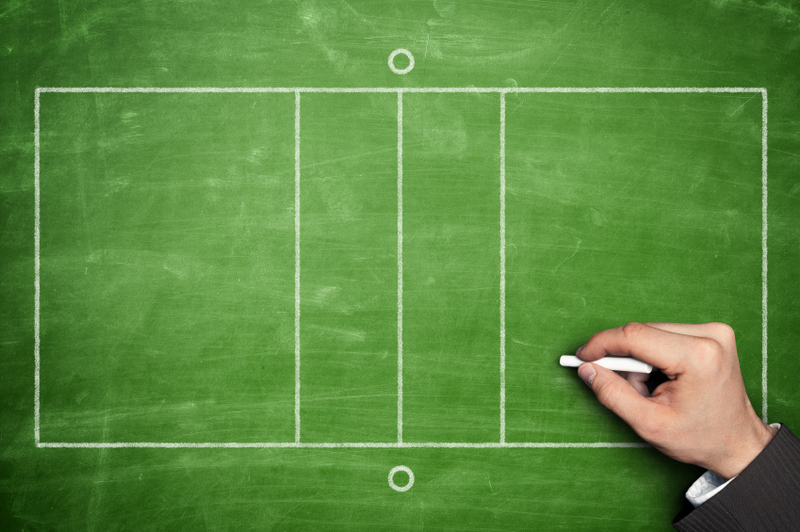 In volleyball the pattern has generally been the opposite. The setter is the one making the offensive play call, usually right before the serve. Sometimes the coach makes a play call in a specific situation. I can remember an instance when I was at Brown where I told the setter to give our OPP a back 2 in a serve receive play because the opposing OH was starting near the antenna and would struggle to get in on the faster set. It wasn’t a play, per se. It was just pointing out a specific mismatch. Most of the time the determination of blocking and defensive schemes are done pre-match. This is either driven by team personnel or based on scouting information. 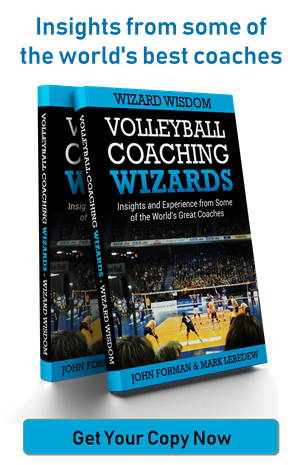 It is, of course, possible to change schemes during a match, like shifting from a perimeter to a rotation defense, Those tend to be permanent calls by the coach, however, as opposed to the play-by-play calls made by the setter. That said, there are situations where short-term adjustments are a good idea. For example, it might be desirable to commit block on a certain hitter in a given situation. In that case, again the call generally comes from the bench. Of course, there’s nothing to prevent an experienced middle blocker making that call. Similarly, a libero may be given authority to change the base floor defense as they see fit. While it’s fairly easy to understand how offensive and defensive play calls can be made pre-serve, the more challenging issue is making calls mid-rally. You do hear variations on this sort of thing happening. I don’t recall many instances of coaches calling offensive plays from the bench during play – at least beyond yelling “Set Jamie!” or something like that. I have, though, seen more of it defensively. Even there, though, it’s more a question of pointing things out rather than actually calling a play. For example, there was UCLA match I saw in I think the 2013 season during which assistant coach Stein Metzger was calling the opposing team’s offensive play. They had clearly seen a tendency to run a specific play when they showed a certain court position configuration coming off serve receive. When Stein saw it he called out “Slide-2.” That’s more about recognition than defensive play-calling, but if UCLA had worked out a specific way to deal with that play, then he was basically signalling the use of that strategy to the team. If you call it, will they run it? 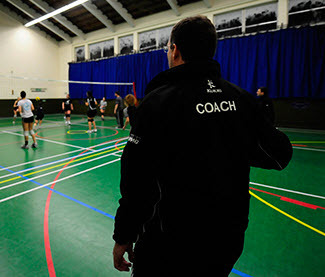 While volleyball, like football, has specific stoppages during which plays can be called by the coach, things get tricky after the first exchange when play shifts into transition. There are two major hinderances to play-calling in transition. The first is whether the players will even hear you yelling from the sidelines. A lot of players say they don’t hear anything from outside the court – the coach, the spectators, their teammates on the bench – and it’s not like you want them to break their focus on the running play to pay attention to you. Even if the players do hear you, there is the concern about speed of transmission. It will take you a certain amount of time to process what you’re seeing, turn that into a play, and shout that to the players. They then have to receive the instruction and process it. During fast-moving play, the decision-making lag introduced by the coach could be quite problematic. I personally am not a huge fan of coaches calling plays – at least in a non-professional or national team type of environment. I consider developing good decision-making in my players to be one of my jobs. Hard to do when you don’t actually let the players make decisions. 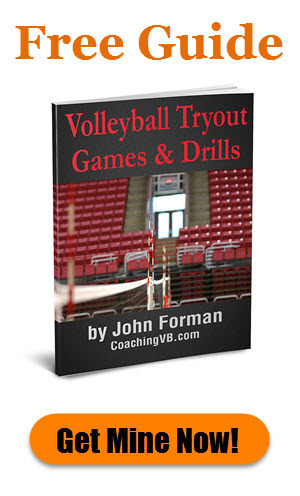 Plus, volleyball is such a dynamic sport that players need to be able to adapt to rapidly changing conditions. We hinder that by making play calls. Do I sometimes call plays? Sure. But when I do I try to make it a learning experience and not just a “Do as I say” sort of thing. As a side note, Mark Lebedew brought up the idea of “scripting” the first X number of offensive plays. This is an idea developed by legendary football coach Bill Walsh (Mark highlighted this book). At least part of the idea of scripting is to be able to get a read on the other team’s defense and/or to set up later plays). It’s conceptually interesting to think about. Actually executing, however, is tricky as you cannot predict pass quality. Is this a new era of coaching? 5 replies to "Calling plays from the bench"
I whole heartily support play calling, but our definition of play calling differs. A play to me is a series of play sets to the attackers. Defensive positioning, rotation, perimeter, man-up, etc are not plays in my opinion. These are defensive systems. Like if we are running a 5-1 or 6-2 offense. I’ve used play sets for the last 15+ years with my teams at the collegiate and club junior level. Primarily the high school age athletes, but have introduced one or two plays to 14s. My athletes at multiple skill levels have not had any issues running the plays I’ve designed. We start out on day 1 pre-season running one basic play. We set up the scenario when the play should be run. The following week or sooner if the team can run the 1st play, we move to a freeball play. Usually two weeks before our first competition we add another offensive play that includes a quick offense. We use that play every time we are in system. Once the team has mastered the basic, freeball, and quick plays we add two combination plays that includes some kind of crossing pattern by middle/right and middle/left. The 15s usually do not get to this level, but 16-18 normally do if they have the talent to do so. The plays that we run seem to be fairly easy to recognize because we give them specific names. Thus far I have used only colors. You mentioned defining specific players to set in certain situations. I have the same thing, but I give each position a number, which I call ‘options’. Middle is 1, right 2, left 3, backrow 4, setter dump 5. These options are based on a philosophy. Like Oliver mentioned, we use hand signals as well as verbal communication. I also implement a system where we can change the options based on opponents we play. If we recognize a primary weak blocker and our rotation have a strong attacker, then our option 1 will go to the strong attacker, 2 to the middle. Thus rotation 2-4 options 1-2-3 are what we established during pre-match, but rotations 1, 5, & 6, our option can change. We practice this scenario when practicing our plays. Thus far in my career play set calling has been a ‘fun’ thing for my athletes. They know what is going on before the play develops. In system we use one play set, if out of system another play set, and if freeball a different play set. They usually know who is going to get set and thus are in position to cover that attacker. The play & option is two words so communication is precise. I honestly wish more teams did this type of system, but on the other hand I’m glad they do not because at the moment our team is at an advantage. We lose to better skilled teams, but we seem to always be competitive, which I value more than the wins and losses. As normal your feedback or your members is always welcomed. Kelly – What’s the difference between your free ball and in-system plays? For me it’s curious that it’s not until the 3rd play that you bring in the quick attack when I would have thought it’d come in at the free ball level. Sounds interesting, Kelly. Can you provide a video that shows those different situations and how they are handled by your setter? What you outlined here seems to be more complex to what I did before. I am always interested to learn from others. And your system of play calling strikes me at first glance as a possible next step to try. Just a remark on offensive play calling. In the past I installed some simple signals for my setters in various teams to indicate which of our own attackers might be a good choice coming next rally. It’s still their choice but could be a help for either a tactical decision or indicating which player might be the best mental choice at this time. I think it works pretty good. Since a setter needs a lot of time to develop this could be a help in having a good learning experience as you suggested in your post.